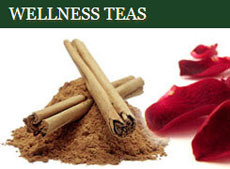 Many of us know a tea drinker who would appreciate a step up in his or her tea drinking. A gift of fine teas is the perfect solution. However, you have to approach the gift in the proper manner to assure that the giftee will get the most out of it. 1. Add to Their Tea Knowledge — Start by making sure you know the level of comfort and knowledge the gift receiver has about tea. Your goal is to help him/her add to that knowledge but not overwhelm. If you give them a one-pound package of tea that is not even labeled in English and has no instructions for how to prepare it, the tea could end up sitting in the back of a cupboard or be regifted to someone else the way that fruit cakes are every Christmas season. 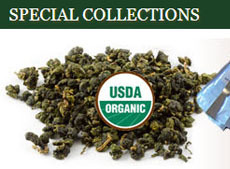 Be sure the tea you select is in a clearly labeled package or take the time to prepare an information sheet that includes steeping instructions. It may seem like too much effort, but the giftee will thank you and your money will be well spent. 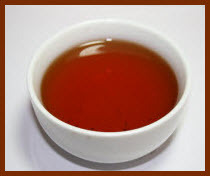 A great tea to give to someone that is primarily into black teas but hasn’t gone beyond that dust-in-a-bag kind is Formosa Ruby Black Tea (Taiwan Tea No. 18), has a natural cinnamon and slightly mint taste and the liquid is a beautiful ruby color as shown above. For anyone who likes Assam, this will definitely be another favorite. And that gift receiver will never go back to that dust-in-a-bag tea from the grocery store. 2. Expand Their Tea Horizons — Often times people get into a tea “comfort zone” and don’t want to stray outside it. They only want the English Breakfast Blend they’ve been drinking for years or a basic green tea, if there is such a thing, flavored with a squeeze of clover honey from a plastic bottle or a slice of lemon floating in it. They’ve heard strange things like “white tea is tasteless” or “pu-erh tastes like dirt” or “oolong is just weird.” These things were probably said by those who had not tried the really fine versions of these teas and/or didn’t prepare the teas in the manner that brings out their best flavor qualities. Select a nice example of one of these misunderstood teas and include as part of your gift not only proper steeping instructions but a suitable steeping vessel. A nice gaiwan, for example, like the Lotus Gaiwan shown below, or a kyusu or one of those cute tiny Yixing teapots. Such tea sets are great for your tea giftee who has been exploring some of the better teas already but making do with steeping them in a more standard style teapot and drinking from a regular teacup. Teawares do make a difference in how the tea steeps and tastes. If you don’t want to go that far, no problem — just do up a simple package of whatever tea you are presenting. Start by putting the items in a simple gift box. It can even be one that you buy in a local store — one of those white glossy heavy paper kind. Use enough padding material such as a suitably colored tissue paper (red and green for Christmas, pink or lavender for Easter, etc.). If you are including anything breakable such as a teapot, be sure it is well wrapped to avoid breakage. 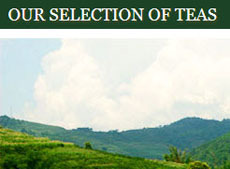 Unless your giftee lives far away and you are not planning on traveling to see him/her, present the gift in person and be ready to answer any questions about the tea or even arrange your visit with the expectation of steeping and enjoying some of the tea with them — sort of getting them started out right. You should have a pleasant reception if you keep these factors in mind when deciding on that tea gift. 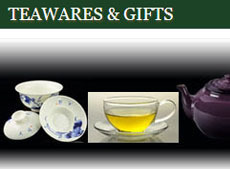 This entry was posted in Holidays and tagged chinese tea, gaiwan, holiday, tea gift. Bookmark the permalink.